A former Obama advisor on civil liberties says Snowden deserves one. Former NSA contractor Edward Snowden has asked President Barack Obama for a pardon, and the ACLU, which represents Snowden in the US, agrees. The following essay by Timothy Edgar, which originally appeared on the blog Lawfare, supports that position. Edgar is the former director of privacy and civil liberties for the Obama administration’s national security staff, and is currently the academic director of law and policy at Brown University’s Executive Master in Cybersecurity program, and visiting scholar at Brown University’s Watson Institute for International and Public Affairs. I have signed on to the letter asking President Obama to pardon Edward Snowden that was released today. I know this will be an unpopular position among many of my former colleagues in the national security community. My reasons for doing so are not fully captured by that letter. They are different from those who see Snowden simply as a hero and the NSA as the villain. I have concluded that a pardon for Edward Snowden, even if he does not personally deserve one, is in the broader interests of the nation. Around the time Edward Snowden got his first job in the intelligence community, I decided to leave my position as an ACLU lawyer in the hope I could make a difference by going inside America’s growing surveillance state. Surprisingly, senior intelligence officials took a chance on hiring me in a unique new office safeguarding civil liberties and privacy. I began work in June 2006. For the next seven years, I worked with a growing team of internal privacy watchdogs inside the intelligence community. We reviewed the most secret surveillance programs in government, including the major programs that Snowden later leaked. Our job was to ensure those programs had a firm basis in law and included protections for privacy and civil liberties. While I am proud of the work we did, it is fair to say that until Snowden stole a trove of top secret documents and gave them to reporters in 2013, we had limited success. It took a Snowden to spark meaningful change. The NSA’s operations are essential to national security and to international stability, but it is hard to reconcile them with the values of a free society. Snowden forced the NSA to become more transparent, more accountable, more protective of privacy—and more effective. Today, the NSA’s vital surveillance operations are on a sounder footing—both legally and in the eyes of the public—than ever before. In the last four years, there have been more significant reforms to mass surveillance than we saw in the four decades before the Snowden revelations began. Not since the post-Watergate reforms of the Ford and Carter administrations has the intelligence community faced such scrutiny. The NSA has taken painful steps to open up. The most secret of the government’s secret agencies will never be a model of transparency. Still, it has never been more transparent than it is today. Before Snowden, basic information like the number of targets of the NSA’s mass surveillance operations affected by court-ordered surveillance was a closely-guarded secret. Today, the head of the intelligence community publishes an annual transparency report that provides these and other details. Before Snowden, the NSA used a secret interpretation of the Patriot Act to amass a nationwide database of American telephone records. Congress has nowreplaced this program of bulk collection with an alternative program that leaves the data with telephone companies. Before Snowden, the secret court that authorizes intelligence surveillance never heard more than the government’s side of the argument. Now, outside lawyersroutinely appear to argue the case for privacy. Before Snowden, there was no written order, directive or policy that gave any consideration to the privacy of foreigners outside the United States. When intelligence officials asked lawyers like me about privacy, it went without saying that we were talking about American citizens and residents. Today, for the first time in history, a presidential directive requires privacy rules for surveillance programs that affect foreigners outside the United States. In an agreement with the European Union, the American government has been forced to adopt new protections for foreign data. In the next few years, the NSA’s partners in the United Kingdom will have to justify the surveillance practices of both countries in court against human rights challenges. In 2017, Congress will review PRISM—a program leaked by Snowden that allows the NSA to obtain e-mails and other communications from American technology companies. The law that provides authority for PRISM expires at the end of the year. The law also gives the NSA access to the internet backbone facilities of American telecommunications companies, in a program called “upstream collection.” Until Snowden leaked details about PRISM and upstream collection, little was known about how the law worked. Thanks to Snowden, the debate over whether and how these programs should continue will be one in which the public is reasonably well informed – unlike the debates in Congress over the Patriot Act in 2001, 2005, 2009, and 2011, over the Protect America Act in 2007, over the FISA Amendments Act in 2008 and 2012, and over the constitutionality of the FISA Amendments Act in the Supreme Court in 2013. The NSA’s new transparency about its surveillance operations showed that they were designed not to bring about a dystopian society where privacy would be abolished, but to collect intelligence vital to the national security. To be sure, Snowden’s trove of documents and the investigations that followed showed some programs were more effective than others. The same privacy board that reviewed PRISM said that the NSA’s bulk collection of American telephone records had “minimal value.” The board could find “no instance in which the program directly contributed to the discovery of a previously unknown terrorist plot or the disruption of a terrorist attack.” Still, there has been remarkably little evidence of intentional abuse of the NSA’s sweeping powers for improper purposes unrelated to intelligence. None was revealed by Snowden. In response to inquiries from Congress in the fall of 2013, the NSA itself disclosed that itsinspector general had uncovered a dozen incidents over ten years in which analysts used overseas collection to spy on ex-girlfriends. Edward Snowden’s actions caused great damage to national security. They should not have been necessary to achieve the sensible reforms of the past four years. That they were represents a failure of leadership by the intelligence community and the national security teams of the previous two administrations. For me, that failure is at least in part a personal one. As a privacy and civil liberties official inside the intelligence community, and later at the White House, my job was precisely to provide top officials with confidential advice about how to ensure that intelligence programs were protective of our liberties. In doing so, I made just the sort of arguments that many have said Snowden should have raised internally instead of compromising classified information. Unlike Snowden, I had direct access to the officials that could have made surveillance reform a reality—and who did so, after the Snowden leaks forced their hand. There is no way a junior NSA contractor could have accomplished more. Snowden’s critics argue that he should have made his concerns about privacy known through official channels without disclosing secrets and without breaking the law. That would have achieved nothing—even in an imaginary world in which the agency had a perfect system for protecting whistleblowers. Snowden’s concerns were not those of a traditional whistleblower. Snowden’s complaint was not that the NSA was violating its rules, but that its aggressive pursuit of its mission—even as it largely adhered to its existing rules – posed a serious risk to privacy in the digital age. If Snowden was wrong about mass surveillance being an “architecture of oppression,” he was certainly right about that, as many government officials have now acknowledged. There is an inherent tension between the values of a free society and mass surveillance. For Snowden and his supporters, the answer is easy. End mass surveillance—which is to say, most of what the NSA does. Those of us who believe that the NSA’s far-flung operations are essential to national security and global stability have the harder task of keeping mass surveillance under control. If Snowden deserves our thanks for both this round of surveillance reform and the next, it is only because the laws and institutions we created to control surveillance had become so obsolete. Intelligence agencies should not need the shock of massively damaging leak to abandon programs that are not working and refine and improve those that are. Disclosing details of classified programs should not be the most effective way to force change. What do we do with Snowden? It makes no sense for the United States government to pursue Snowden like a digital age Inspector Javert while at the same time admitting that his actions strengthened both our civil liberties and our national security. This is especially true because it was the intelligence community’s own shortcomings that made his reckless leak the only effective way to achieve reform. If Snowden returned to the United States today, of course, he would have to stand trial for disclosing classification communications intelligence, among other serious crimes. This will never happen. 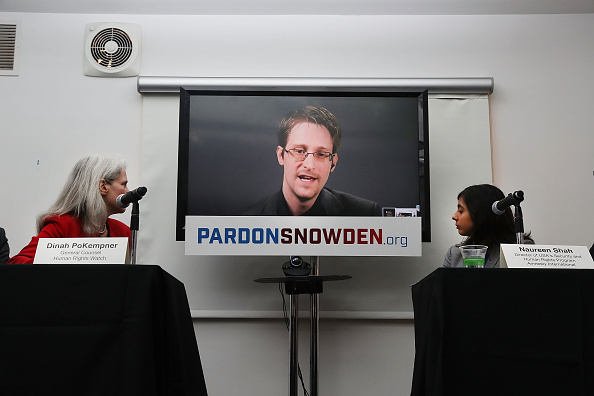 Snowden’s lawyers know he would likely be convicted and would face a lengthy prison term. Under federal sentencing guidelines, an offender with no criminal history who is convicted of disclosing “Top Secret” communications information under 18 U.S.C. § 793(d) faces a prison term in the range of 168-210 months, or 14 to 17.5 years. See U.S.S.G.M. § 2M3.2. Snowden might face a considerably longer sentence if convicted of additional charges, or as a result of sentencing enhancements. Naturally, Snowden prefers to stay abroad. The law does not allow the public interest defense that Snowden says he wants, nor should it. Permitting such a defense would encourage copycats. A Snowden wannabe might hope his lawyer could convince a credulous jury that his leaks also had some positive outcome, even if the benefits were scant. The Snowden disclosures were a unique watershed event, resulting in historic reforms. It is highly unlikely a future leak of classified surveillance information would produce such positive change. While Snowden might be enticed to return if offered a favorable plea agreement, negotiating such a deal would create poor incentives. One idea, favored by the top lawyer for the intelligence community, was for Snowden to plead guilty to a single felony charge and serve three to five years in exchange for his help undoing the damage he caused. Through his lawyer, Snowden has said he would never plead guilty to a felony. If a plea deal was ever really on the table, Snowden has less to offer every day, as the information he leaked becomes stale and the intelligence community moves on. In any event, the Justice Department rightly objects to negotiating plea agreements with fugitives, to avoid giving those who flee prosecution an advantage over those that do not. Nevertheless, the status quo is clearly not in American interests. Snowden’s exile in Russia is a continuing embarrassment. Snowden has become a potent symbol for privacy and civil liberties, human rights, and an open internet in which surveillance operations are controlled by law. His presence in Moscow is a gift to Vladimir Putin, allowing the Russian president to cynically pose as a defender of digital human rights. Every time Snowden makes a virtual appearance before his admirers, the unspoken message is that he has been forced to seek asylum because the United States opposes these values. The message is no less effective for being false and unfair. By contrast with a trial or a plea agreement, a pardon is an unreviewable act of discretion by the president. Presidents have used them not only to correct injustices, but also when the broader interests of the nation outweigh the importance of punishing a crime even where some punishment is clearly deserved. Gerald Ford pardoned Richard Nixon to help the country move beyond Watergate. Jimmy Carter pardoned draft dodgers to close the chapter on the Vietnam War. Pardons are exceedingly rare. A pardon sets no precedent and so creates no incentives. Future leakers could not count on one. Even if Snowden does not deserve a pardon for what former Attorney General Eric Holder called his act of “public service,” we should give him one and move on. We are the good guys. It is time for the world to know it again.